Were you looking for the D77-TC Pelican, introduced in Halo: Combat Evolved? For the Pelican introduced in Halo 4, see D79-TC Pelican. The D77H-TCI Pelican, formally known as the Dropship 77 Heavy-Troop Carrier/Infantry and more commonly known as the Pelican, is a newer model of the D77-TC Pelican dropship. It appeared to have largely supplanted the original D77-TC model in the UNSC Marine Corps and Navy, at least in the Earth theater of operations, by late 2552. 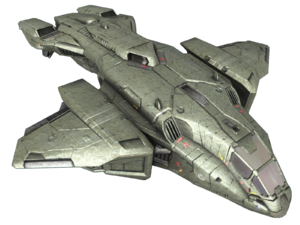 The D77H-TCI Pelican is the primary tactical support aircraft of the UNSC. Like the previous model, the D77H-TCI Pelican serves a multi-role purpose. The dropship is fully capable of atmospheric flight and can land almost anywhere without difficulty. It is also capable of limited spaceflight, making it the prime troop transport of the UNSC. There are several interior and exterior design differences between the D77-TC and D77H-TCI models. Most notably difference is in the cockpit area. Instead of the pilot and co-pilot sitting next to each other, the co-pilot is seated behind and above the pilot, and the controls and instrument panels are rearranged and upgraded. A small holotank is installed in the cockpit, allowing an artificial intelligence to project its holographic avatar to the craft's pilots. There are also differences in the bay of the craft: the so-called "blood tray". Although the D77H-TCI Pelican carries the same number of passengers as its predecessor, its troop-bay is more flexible, able to carry up to two M274 Mongoose ULATVs internally, in addition to ten passengers. Like the original models, the D77H-TCI's tail-mounted magnetic clamps are capable of carrying an M12 Warthog FAV, an M808 Scorpion MBT, or several resupply canisters. The D77H-TCI Pelican, like its predecessor, can be armed with a 40mm or 70mm chain gun, an M638 20mm autocannon, a rotary machine gun, or a pair of twin-linked rotary cannons. The Pelican is also able to mount a machine gun - typically an AIE-486H Heavy Machine Gun - in its troop bay for supporting ground teams and covering the departure of its passengers, although this prevents it from carrying a vehicle internally. The D77H can also be equipped with ANVIL-II Air-to-Surface Missile pods; rather than being externally mounted to the wings, these pods are integrated seamlessly into the fuselage. The ANVIL pods can fire up to twelve missiles at once, six from each pod. A gunship version of the D77H is in service as well; this heavily armed version is equipped with more chainguns, missiles, and a large cannon mounted at the ventral-fore of the dropship. The main engines are mounted in pairs in four nacelles, with one situated on each wing and two at the rear and posterior. The nacelles can articulate independently, thus altering the direction of thrust, referred to as vectoring in aviation; this improves the Pelican's low altitude maneuverability. Four ventral thrusters are identified by markings and a rendered thrust effect, one on each wing nacelle and one on each aft nacelle, allow the drop ship to land and take off vertically. These engines are capable of both space and atmospheric operation. It has eight jet intakes, three on each side and two on top, though intakes are obviously not able to function in a vaccuum. The D77H-TCI, like the D77-TC, although fully capable of orbital insertion, is too small to be equipped with a Shaw-Fujikawa Translight Engine, and thus is incapable of Slipspace travel. This model was used from 2552 to 2553, only to be supplanted around 2557 by the D79-TC Pelican. The D77C-NMPD is a variant of the D77H-TCI that was utilized by the New Mombasa Police Department in Kenya, Africa, on Earth. It was differentiated from its military counterpart by a black and white color scheme, with the word "POLICE" replacing the traditional "MARINES" on the external hull, and a noted lack of armament. Under the craft's chin, where a machine gun turret or autocannon would normally be installed, were various interchangeable sensors used by the police for aerial surveillance and crowd control. An AIE-486H Heavy Machine Gun was typically mounted in the personnel bay of the D77C-NMPD, similarly to the D77 and D77H models. A detail fore view of the D77H-TCI Pelican Dropship's cockpit. A demonstration of the troop bay's size. D77H-TCI Pelicans under construction in Halo: Landfall. The D77H-TCI in Halo 3. A frontal view of the D77H-TCI, affixed with ANVIL-II pods. A bottom view of the D77H-TCI. The rear seats of a D77H-TCI Pelican. The cockpit of the D77H-TCI. Another view of the cockpit. D77H-TCI dropship outside The Pit. A D77H-TCI dropping off two ODSTs on Installation 00. A crashed D77H-TCI on Installation 00. A D77H-TCI crashed on High Charity. A comparison of the D77H-TCI and the D77-TC. Several D77H-TCI along with Longswords during the mission to Ven III. ↑ Though the Halo: Reach manual identifies the Pelican in the game as the D77-TC model, all Pelicans seen in-game have the same internal design as the D77H-TCI, notably including the tandem seating configuration. This is most easily seen in the level The Pillar of Autumn.